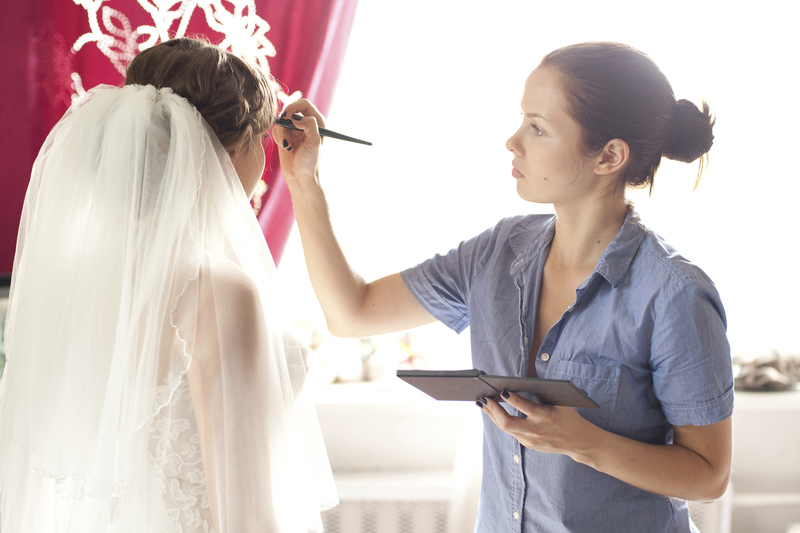 The majority of brides will hire a wedding makeup artist to create the perfect look for the wedding day. Even if you’re thinking about doing it yourself, it is worth asking for a professional advice beforehand to ensure you get it right. When it comes to choosing your makeup there are a lot of things to think about, such as how your makeup will look in photos and what tones will work with your dress, so consulting a makeup artist is a great idea. A good wedding makeup artist should make you feel like a valued customer, and should be happy to schedule enough time for a makeup trial. Although it is generally only the bride that had a makeup trial, a professional makeup artist will be willing to try out a bridesmaid’s makeup as well if you bring her along with you. They should also be more than happy to repeat the trial if you are not satisfied and to try out a variety of styles even if the first one seems fine. Creativity and skill is important in a wedding makeup artist but there will always be more practical things to check and ensuring that they are available on the day of your wedding is the most important one! Asking if they are willing to travel to the venue where you will be getting ready is another; it isn’t a clever idea to pick a makeup artist in your home city if you will be getting married hundreds of miles away. Are they interested in your wedding? Your wedding makeup artist should want to know every detail of your wedding as they will need a lot of information to determine the perfect make up for you. A good makeup artist should ask whether you are going to have fake tan applied or to colour your hair prior to the wedding as this can have an influence on the makeup shades they pick and they should be able to offer tips on a skincare regime to use before the wedding. They should also ask about the what kind of venue you have booked, how the lighting works and looks, what colour your gown is, what jewellery you are using, and what colour scheme and flowers you have picked. It is essential that the person doing your make up is someone that you like, that makes you feel at ease, and that you can enjoy a laugh with. They will be there on the morning of your big day, and will have to manage at least part of your pre wedding stress so make sure you pick someone that is a calming person and not someone who will get you more stressed out. While the wedding makeup artist is the professional, they should still listen to the type of wedding makeup that you want, and to try out any special requests you might have. Makeup is a very personal thing as it can drastically alter your look in just a few brushstrokes. Picking a makeup artist that will cater to your style wishes rather than doing whatever they think is right is important.